I made it to another update! I have to be honest with you, the 37th week of this pregnancy was mentally tiring on me. I went through a couple of days of feeling really grumpy and ragey, for no particularly good reason. The only thing I can really think of is that I had it in my head since Ethan was born this week, there was a high chance that this baby would come this week too. I felt anxious and like I was on pins and needles, but now that that time in this pregnancy has passed, I feel an odd sense of relief and I’m happy to go back to waiting for baby to come when they want…not that I have any say or choice in the matter! Total weight gain 35 lbs, I actually lost 0.4 lbs this last week…somehow! Made it to my hair appointment, yay! Starting to feel more pelvic pain and pressure, I’ve never been able to tell if baby has dropped or not, I just assume s/he is on the way down! The Vein is bulgy and gross and now I have a ton of purple spider veins on the back of my right leg and by my ankles. So so gross, but hopefully they go away after baby is born and at least they aren’t painful. As I started off saying in this post, I now have a sense of peace about the end of this pregnancy. 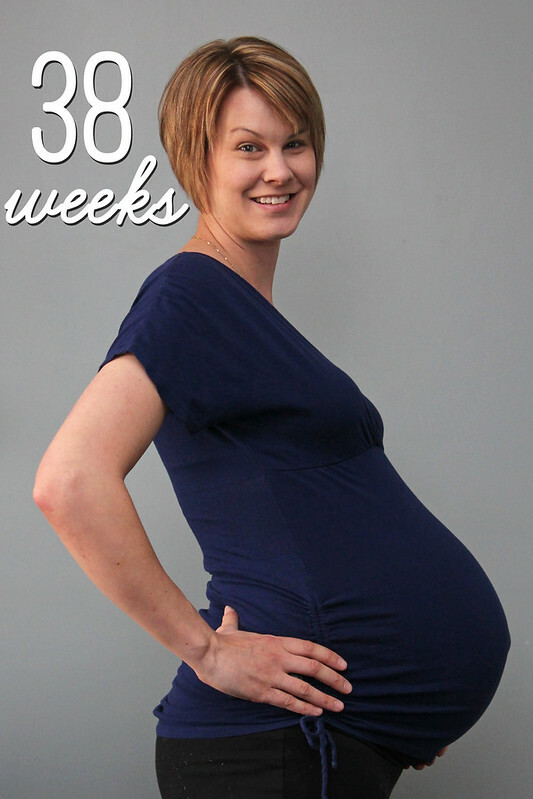 In my 36 week update, and certainly through the 37th week, I wanted to be DONE. Part of me also assumed there was a good chance I’d be done too, because that’s when Ethan was born. I’ve been praying (and would welcome your prayers too!) SO MUCH for God to take my anxieties away. I cannot waste time worrying on the “when and where” I’ll go into labor and have this baby. I have felt so much more at peace now that the milestone of Ethan’s birth time in this pregnancy has passed, as well as the anniversary of my dad’s death coming and going – April 21. I really, really did not want to have a baby on that day and I’m very thankful that day has come and gone. It was hard on me this year because I felt a sense of disappointment and even mildly upset/angry that dad is missing out on yet another grandchild. I’m mentally ready for the longer haul of this pregnancy, and despite my guess of April 28 in our baby pool, my LMP due date of May 7 is looking more and more likely and I think we’ll have a May baby. I feel like this baby is going to hang on until the end and perhaps even go overdue, and truthfully I’m okay with that…we might even be done seeding by then! My doctor is actually gone as of May 4, I assume for at least a week, so I’m also mentally at ease with him not being there. I know I will be in good medical hands no matter who my doctor is, so I’m ready for that too. I know this is in God’s hands, I just have to keep praying and reminding myself of the same. Also? The baby is very easy to take care of right now, all comfy and cozy in there, so I might as well enjoy and savour every moment that s/he is cooking, I figure! My physical pains of this pregnancy are dissipating, for the moment anyway, which I am thankful for. The boys are so excited for their baby brother or sister and it completely warms my heart. Ethan asks to see my belly often throughout the day and he pokes my (very) outey belly button and asks “how you gonna get the baby outta there?” and “your tummy is getting so bigger!”, just like Braden used to tell me when I was pregnant with Ethan. My dear friend Samantha is on call to take photos of this L&D and I hope that it works out that she can join us again, but I am also ready and prepared if that doesn’t work out. I’ve been having “real” contractions, which never happened with the boys until it was go-time, but they mostly come when my bladder gets too full. Very irregular and inconsistent, but if they’re doing a little pre-work, I’m okay with that! I’ve read that this can happen if the baby isn’t the ideal position, to encourage baby to turn into the correct position…so who knows. It’s a little preview of what’s to come, and I gotta say it’s another reason why I don’t mind if this baby stays put for awhile longer. You think you forget what contractions feel like and that it “mustn’t be that bad”…but let’s be real — it hurts! Hoping for a safe and speedy delivery…I can only hope! Well, I guess we see it if I make it to the 40 week update and beyond now! P.S. A sincere thank you for the love, interest and kindness shown to me and my family throughout this pregnancy. It truly means so much to have so many people excited for this baby just like we are! Congrats Sarah, enjoy the journey to your new little one! Have been loving reading all of your updates lately – not that I don't normally anyway…but there's something special about a new baby! Love that your blog is a mix of farming, family and everything in between. All the good and easy labour vibes being sent your way! Take care and goodluck! Thank you so much, Erin, means a lot! Especially since I've focused more on farm family 'life' than farm/ag controversy lately! The waiting game can be super tough. I hope you have a safe and speedy delivery. It sure can! I got over the hump of the 37th week and I am feeling good now!